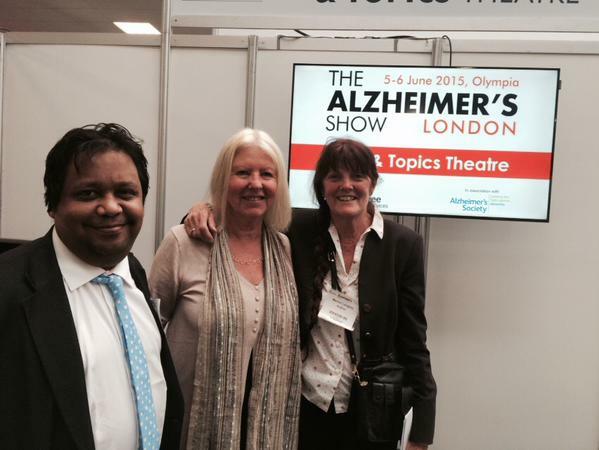 Today, I was honoured to be invited to speak about my work on dementia in a session called “Meet the authors” at the Alzheimer’s Show here in London Olympia. Thanks to Nigel Ward for organising this year’s programme, and to my co-presenters Marion and Maggie who presented their books on personal life experiences of caring in dementia. I strongly commend these books to you; “Have you seen my daughter?” and “The Gift of Alzheimer’s“. A recording of my talk is provided here. Thanks to Gary Marsh (@mistersquash) for recording it on an iPad; please note that the concourse of the exhibition is very noisy, so there is inenvitably a lot of background noise despite the excellent sound system. 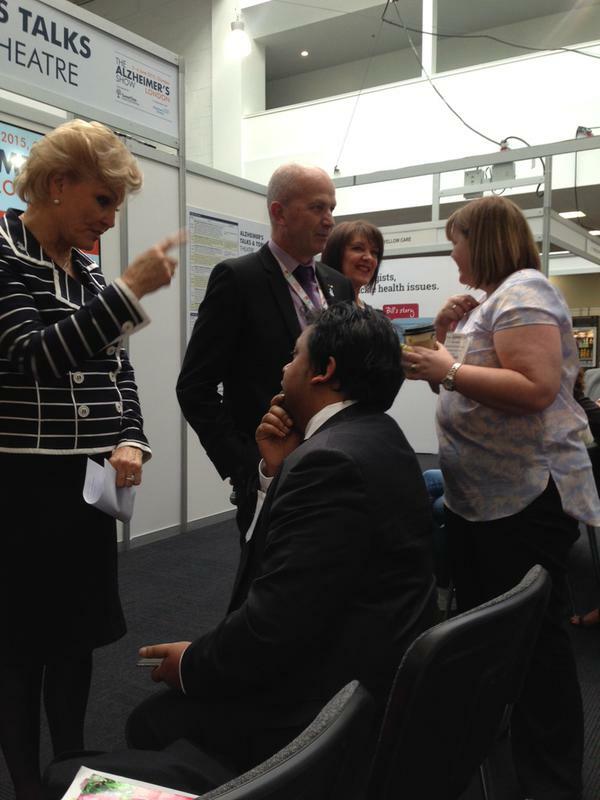 I greatly admire Angela Rippon for promoting policy issues in dementia, but especially in inter-generational education of living with dementia. Any individual’s wellbeing is more than their interaction with health and care systems. Wellbeing is not simply an absence of ill being, and many factors are known to determine one’s health in the social strata such as housing and transport. Many phenomena are not just physical buildings, such as hospices or care homes, and it is now being increasingly recognised that they act as community hubs in the wider community. It’s become ‘acceptable’ to celebrate very good care, and is in fact now being strongly encouraged in national policy to promote good practice. All too often boundaries can get established, creating distinct silos; sharing is “king”, but secrecy can be fatal. Even regulators are taking on the mantle of trying to advance promote good care, as well as identifying when things have gone wrong. It’s easy to unappreciate the potency of a number of different separate strands which have converged on the potential of ‘living better with dementia’. These include, for example, developments in the law, such as safeguarding under the Care Act to mitigate against neglect and abuse, initiatives to encourage ‘integrated care’ such as the ‘Better Care Fund’, the recent public health initiatives to increase knowledge about dementia in the public (“Dementia Friends“). Also, instruments in international law, such as the United Nationals Convention for People with Disability, have set the weather, in the way that, say, the Human Rights Act, possibly about to be repealed, might not. But troublesome faultlines remain. For example, NHS spending is notionally being ringfenced, despite increasing ‘demand’ , but social care funding has not. The budget for Health Education England is substantially more than for Skills for Care, for example, reflecting different institutional priorities between professionals and practitioners perhaps. When somebody receives a diagnosis, it’s invariably their friends and/or family who also deal with the diagnosis as a “team effort”. While the actual disclosure of dementia can be suboptimal, and here we need to be particularly mindful of success of people from different cultural backgrounds and with learning difficulties in obtaining a diagnosis, sometimes post-diagnostic support can be diabolical. It might be a question of knocking on various doors, such as hospital services, or social care, but without proper care coordination, the system may present itself as a higgledy piggledy mess. Whilst research into better treatments is clearly for the benefit of society, we have to be realistic about we can achieve; we are unlikely to achieve ‘a cure for dementia’, in the same way that progress for the cancers, in treatments producing virtual remission, has been piecemeal across the years. Progress is nonetheless being made, not least in identification of key issues. For example, people presenting with younger onset dementia often are testament to the notion that dementia’s not only about memories; some persons with ‘posterior cortical atrophy’ get driven round the houses seeing opticians for their complex visual problems, before seeing a cognitive specialist. Above all in policy, we do need to learn from each other, and top of this must be the living experience of people living with dementia and those who find themselves in a caring rôle, often relatively underreported with little formal introduction from training. There’s been a lightbulb moment in policy, where it’s been OK to acknowledge that there’s space for all of us; for example, dementia advisers do different things to dementia support workers, or clinical specialist nurses. Not everything is clinical (indeed the policy drive has been to rely less on drugs where drugs are inappropriate). Different parties have different expectations, such as in the education and training of others, ability to enable and protect carers and people with dementia with coping strategies, or attention in specialist areas such as end of life. A system oriented at wellbeing necessarily expects you should look at what people can do, rather than punish them for what they cannot do. I myself am now physically disabled, so the idea of reablement and rehabilitation is one I philosophically enrol to. And such an approach has to be joined up; and personalised. We all prefer have own clothing tastes, reflecting our experiences in the present and future. You’d never embark on making people all dress the same; so therefore an approach which totally disregards personhood is now totally unacceptable. We’ve come a long way, but I can’t emphasise enough how I feel ‘experts by experience’ must be in the driving seat in service design, even including ‘new models of care’ and research priorities. These issues are not easy, often controversial, but I feel strongly we should not “shy away” of confronting them. The Amazon page (yet to be fully updated) is here. What do national dementia strategies, constantly evolving policy and ongoing funding difficulties mean for people living well with dementia? Adopting a broad and inclusive approach, Dr Shibley Rahman evaluates critically existing dementia policy. He tackles head-on current and controversial challenges at the forefront of public and political discourse, such as leadership, access to services for marginalised groups, stigma and discrimination, integrated care, care and support networks, rights and budgets, personalised medicine and the use of GPS tracking. 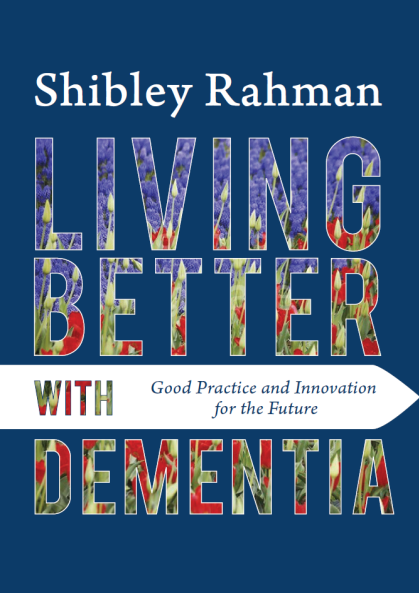 Drawing on a wealth of diverse research, with voices from around the world, he also identifies positive avenues for living better with dementia, such as creativity, and highlights pockets of innovation and good practice to inform practical solutions for the future. Shibley Rahman graduated in neuroscience and medicine from Cambridge University. There he also completed his PhD in frontotemporal dementia, commencing a lifelong interest in the timely diagnosis of dementia. He also trained to postgraduate level in medicine, law and business. Shibley speaks regularly about dementia diagnosis and post-diagnostic care, researches wellbeing and advocates rights-based approaches.